Join our list and get 10% off immediately. Yes, we do ship overseas, and to Canada. Browse by Yarn Type: Go To...... Artyarns Alpaca Yarns Handpainted Yarns Silk Yarns Boucle yarns Bulky Yarns Handspun Yarns Novely Yarns Wool Yarns Knitting Needles Bookstore! 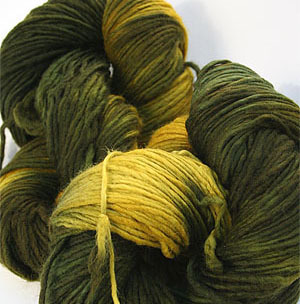 How are Handpainted Yarns made? 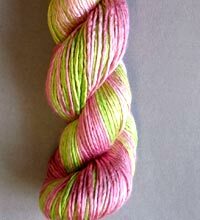 Each hank of handpainted yarn is individually painted with colorfast dyes, then rinsed repeatedly to remove excess dye. When you handwash your garment, the dye color may appear in the water, but this will not change the color of the yarn; it is simply excess dye washing away. Handpainting yarn is an art and each handpainted hank is unique. 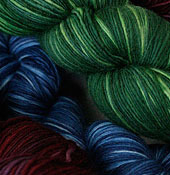 Yarns are often painted in batches of 4 to 6 hanks. Colors vary from one batch to another, so purchase enough at once to complete your project. 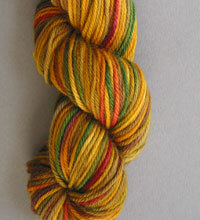 The dyer rinses her yarns many times, but handpainted yarn will often bleed a bit more dye. Dye may come off onto your hands as you knit. The dye is harmless and easily washes away with soap and water. Alternate hanks as you knit by working 2 rows from one hank, then 2 rows from another hank, etc. This helps avoid striping or pools of one color and create a more uniform and even distribution of color. With mitered or modular knitting, you may wish to use one hank for one piece and another hank for the next piece. This technique gives a mosaic look to your garment. Just remember to treat each hank as a different color and you'll only have happy surprises. You may dry-clean your completed garment once to help set the dye, but thereafter it is still best to handwash the garment separately in cold water and lie it flat to dry.